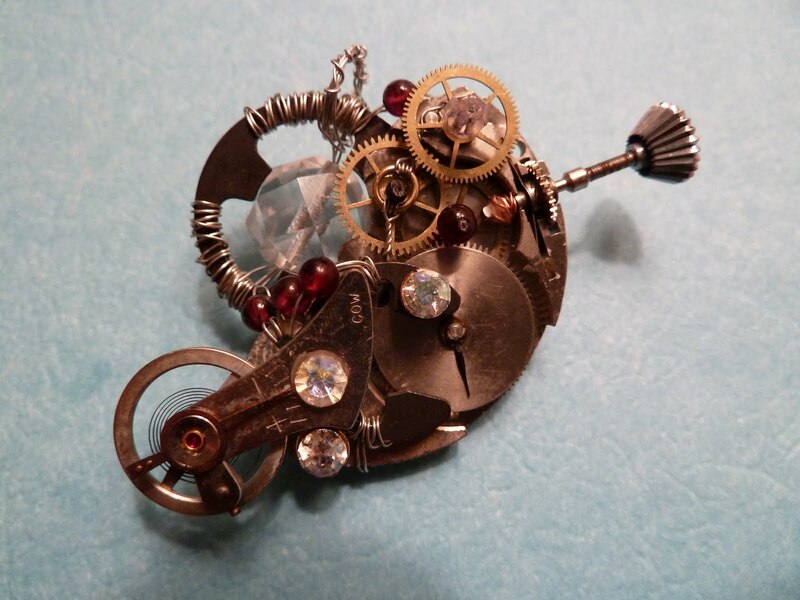 Crazy Trip™ 2010: Post 3 (Steampunk Gizmo p2) – Words, Words, Words. All but the topmost gear move, driven by the winding rod or the large, central gear. The wheel on the bottom left (the spring mechanism) also moves. I’m quite happy, especially considering I was learning as I went along. Next time—and I can promise there will be a next time–I’ll have a better idea how to hold the gears in position. In the original stopwatch set-up, they are held in place by two metal plates. Holes in the plates accept the pins which run through the center of the gears, allowing them to spin freely. Maybe next year, I’ll have a bunch of Gizmo-esque items to sell at the RWA Conference’s bazaar. Something bizarre for the bazaar. And a fun pastime, too.